and bingo, there are signs of recovery, toadstool opening up again, other leathers now opening periodically, the amount of pearls in reactor was under the stated recommendation, I took these offline and what a stink!! Yes they reduce No3 and Po4 but I believe that they are just too good at the job, my No3 Po4 are now at trace levels but although I can't 100% categorically state it I believe they strip some other elements out of the water. I hope this info will help others considering this course of action! Yes they work, but use with caution! however I think it would be better to have unhappy people compared to dead coral. Anyway, my tank is 55 gal. Ammonia-0, Nitrite-0, Nitrate-0-25, Salinity-1.025, Temp-80, large hang-on back filter, Ca-400ppm, pH-8.4. Lit by four 65 watt power compacts. In order to keep LPS coral, Frogspawn, Torch, Bubble, Plate, Cyphastrea, is it essential I add two 125 watt power compact to this? About 15 pounds live rock. 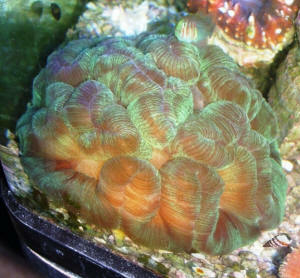 Obviously aggressive skimming is needed but with it could a Bubble-Tipped Anemone be added? Percula Clown. Is this over stocked? I want to also make sure I understand correctly: There is absolutely no way to keep the star with coral correct? What order should the above coral be added. Currently no coral are in the tank, I was highly allergic to the worms living in the tank and so everything was wiped out in their removal and the restart isn't as great as it sounded at the time. So the tank is roughly 8 months old. Your reply in an opinion form would be greatly appreciated. Thanks. there are a couple more issues that I will address in order of attachment. Also let me know if it is labeled properly. One was labeled as a Cynarina. It has quite a bit of skeleton poking out. When I did try to feed it, it blew up and very little skeleton showed so I am hoping it will make it. I did not see it eat but it did react. 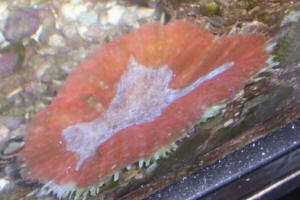 The next is labeled a Lobophyllia it is red with a green center and the skeleton is poking out all around. No reaction to feeding and I do not see any change in size. But the colors are bright. 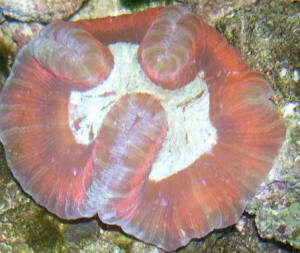 The next was labeled a Wellsophyllia. I think it is a Trachyphyllia. I put it at the top of my rock, about 10 inches from top, on a large half shell. It is about 3 inches when closed and get as big as six inches. I put some Mysis on it and it enveloped it. Looks very healthy and a nice mix of colors and some green and blue sheen. The next was labeled Wellsophyllia worm. It is green with some purple highlights which did not show in the picture. It is about 3 inches when lights are out and about five when open. I did not see any reaction when trying to feed it. Looks very healthy to me. It is at the bottom but it really has no room there literally between a rock and a hard place. I got these through EBay and got more than I expected but that is another story. 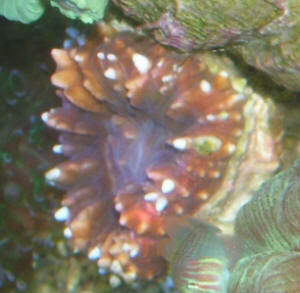 Nitrate and Frogspawn coral Hi: I am just new to reef tank, 2 days ago, I just introduced a Frogspawn coral to my 20g tank, and later I found my water is not perfect -- ammonia 0.1, nitrite 0, but nitrate 10, the coral is still opening, but seems not every tip is opening, should I have to quarantine it, or please advise what I should do to save it. <The ammonia is far more dangerous than the nitrate. Nitrate at 10 ppm is not something to worry about, however, keep an eye on that ammonia. As long as it disappears, the coral should be ok, as long as you have proper light and water motion> Appreciate for the help Shane <best, Chris> Shane Lee, Ph.D.